We intentionally create our lives through emotion, which in turn, directly allows us to manifest accordingly via our thoughts as The Law of Attraction promises. Lunar energy from above is astrologically in charge of how the messages of our human emotions play out in precise timing. We are always offered the chance to evolve and align down here below, yet equally we must remember we energetically cannot solve everything we may need to in our lives all at once. Everything meant to emerge has a precise rhythm and measured motion in our timing. Waxing Phases favor actions involving planting anew and moving forward, as energy increases throughout one half of your Zodiac Pie from 15 degrees Aries through Taurus, Gemini, Cancer, Leo, Virgo and Libra until the next Full Moon at 29 degrees Libra 19 April. This first New Moon of Spring and fourth for 2019 falls within the sign that consciously aims for leadership, individuality, independence and honoring our inspiration. It is time to humbly take charge and cast ego oriented airs aside within the Aries area of our life that now actively seeks our attention and full concentration concerning what is new. As our free will embraces straightforwardness and accepts that patience deeply assists us to watch our assertive beginnings successfully unfold, we are equally asked to honor materialism with humility by our side into our personal pictures. We feel completely energized upon this particular New Moon, to fully commit to the new we are receiving within Aries, making sure modesty is our guiding light. Now that Mercury Retrograde is over and it’s Shadow correction period lifts by 16 April, under the year’s second passage of Thriving in 2019 under All Planets Direct Motion, we are more than favored to eagerly place our feet back on the gas in our life and intently practice CONCENTRATION as we do so. We have another distinct opportunity as our previous Libra, Scorpio, Sagittarius, Capricorn, Aquarius, and Pisces New Moons offered in October, November, December of 2018, January, February and March- to tap into what needs to be further understood concerning our relationship to materialism across the board. This is the final New Moon in a series of 7 that have all fallen at the 15th degree. The entire world is being distinctly asked to come into a powerful realignment concerning our relationship to materialism, which has been asking for a complete leveling up to simplification towards it across the board. Those missing this important consciousness memo naturally will continue to witness upsets and situations to personally arise in the future. As we set our rightful intentions now, these potential negative outcomes can be completely averted. This New Moon at the 15 degree point of Aries specifically asks that we look at both sides of any issue concerning the value of materialism where The Ram seeks our enthusiasm and need to cultivate forethought and humility in order to shine in our lives. We are advised to be aware of any reckless, aggressive or disobedient behaviors around us. It is critical at this time our patience works for us, not against us in displaying hasty tempers, nor forceful or militant airs. As we tune-in emotionally to the rewards of listening to our powerful instinct and keen imagination, we can crusade with our pioneering feelings as we implement moderation. Even as the directions of our feelings can quickly change, this lunation fully supports bringing us to an exciting place that is happy to receive the new seeds we are planting, as long as humility is our deepest intention. Spring’s 1st & 2019’s 4th New Moon is here Dear Star! How will you embrace Honoring Materialism with Humility? ARIES: It’s time to focus upon the new with who I Am, relating to your appearance, emerging self, and the mask you wear to the world. Remember the inner work you have recently done is not about being selfish, as your self-care now allows the world to witness a considerable difference about you. TAURUS: It’s time to focus upon the new where I Process, relating to your solitude, retreat, inner work your subconscious and dream state. As you are starting to see how your future looks brighter, you can be more at peace with your inner being and allow your new light to shine from within. GEMINI: It’s time to focus upon the new where I Socialize, relating to your future goals, aspirations, friends, groups, peers and ultimate hopes and wishes. Now that your career is starting to sort itself out, the time is now to move forward with spontaneity concerning all of your future activism. CANCER: It’s time to focus upon the new where I Structure, relating to your career, public and professional life and views upon authority. You know more about the truth as your beliefs recently learned to rely more upon your instinct, allowing you the confidence to rise to the next vocational level. LEO: It’s time to focus upon the new with what I Believe, relating to your willingness to be educated, abilities to grow, stand in your truth and express your philosophies. You must trust the rebirth process still in play, and step fully into the expansive energy that being reachable and teachable is genuinely all about. VIRGO: It’s time to focus upon the new where I Transform, relating to your wealth, sexuality, abilities to transform, regenerate and change. Now that your relationships are on their way to better days, be excited that an accelerated energy is carrying your entire scope of life to a completely different level to enjoy. LIBRA: It’s time to focus upon the new where I Relate, connecting to your partnerships, legal agreements, business and personal relationships. Your recent lifestyle alterations and improvements continue to allow you to serve them differently, and those you relate to most are happy your habits changed. SCORPIO: It’s time to focus upon the new where I Serve, relating to your habits, routines, service to self and others, and your physical health. Now that you are back from your intense recreating adventure, you are putting all the pieces of the puzzle together and getting playful about your new harmonious lifestyle. SAGITTARIUS: It’s time to focus upon the new where I Create, relating to your brain children, manifestations, physical children, love affairs and pleasures. As the kinks get further ironed out on your home front, know all these recent shifts are for the best and were meant to allow you more space to create more clearly. CAPRICORN: It’s time to focus upon the new with how I Nurture, relating to your home, family, closest environments, psyche and paternal energies. As your peace of mind continues to realign, capture all these good feelings and nourish them, and you soon find they will become familiar to you. AQUARIUS: It’s time to focus upon the new with how I Communicate, relating to your thinking, mentality, mindset, siblings and neighbors. Even as the recent resetting of your value system has you feeling more secure, be sure to capture all the brainstorming ideas striking up to align even more. PISCES: It’s time to focus upon the new with what I Have, relating to your income, values, possessions and overall sense of security. As a fresh fearless face of you continues to emerge to the world, know the abilities you have to take action to bring more harmony into your life are alive and well. What’s your Personal Forecast say for this Aries New Moon & All Planets Direct Motion from your natal chart? BOOK NOW and schedule your private session with Sharita! Waxing Phases favor actions involving planting anew and moving forward, as energy increases throughout one half of your Zodiac Pie from 15 degrees Pisces through Aries, Taurus, Gemini, Cancer, Leo and Virgo until the next Full Moon at 0 degrees Libra 20 March. This third and final New Moon of Winter 2019 falls within the sign that consciously aims for understanding, receiving impressions, listening and honoring our intuition. Our abilities to believe, permeate, sacrifice of the self and discern any delusion or illusion within this area of our lives is concerned with what is new via its’ energetic channel as our free will embraces concentration and accepts that avoiding stimulants deeply assists us to watch careful beginnings unfold. We are extremely forewarned upon this particular New Moon, to guard against fully committing to the new we are receiving within Pisces, as Mercury Retrograde begins in this very same Pisces area of the life just the day before. The very degree point it Retrogrades back to by 28 March, is one degree away at 16 from 15 degree point of this New Moon. So as all bets are off until Mercury is Direct, only then can we proceed forward with any initiations intended for future success. We have another distinct opportunity as our previous Libra, Scorpio, Sagittarius, Capricorn and Aquarius New Moons offered in October, November, December of 2018, January and February to tap into what needs to be further understood concerning our relationship to materialism across the board. This is the sixth New Moon in a series of 7 through 05 April 2019’s New Moon in Aries that falls at the 15th degree. The entire world is being distinctly asked to come into a powerful realignment concerning our relationship to materialism -which if denied- will cause upsets and situations to personally arise that could otherwise be completely avoided. This New Moon at the 15 degree point of Pisces specifically asks that we look at both sides of any issue concerning the value of materialism where The Fishes seek our sympathy and need to cultivate determination in order to shine in our lives. We are advised to be aware of the high sensitivity around us. It is critical at this time our imagination works for us, not against us in self-deception or sacrificing ourselves for others before addressing ourselves first. By tuning into the rewards of a silent listen, we have the means instead to bring integrity to our intentions as we can rapidly receive clarity. An absolute and undeniable responsibility to trust our intuition versus be mislead by it, allows us to no longer deny its’ value in our lives. This lunation is fully supported to bring us to a profound place that will reestablish, regenerate and overturn anything that is not be presented to us in the genuine truth. Winter’s final & 2019’s 3rd New Moon is here Dear Star! How will you embrace Responsibly Rectifying the Illusion of Materialism? ARIES: It’s time to carefully focus upon the new where I Process, relating to your solitude, retreat, inner work your subconscious and dream state. Take this time to be carefully considering career moves, especially those that are most associated with the value of your income. TAURUS: It’s time to carefully focus upon the new where I Socialize, relating to your future goals, aspirations, friends, groups, peers and ultimate hopes and wishes. Accountability to experiencing your growth and teachable side must believe that it is your approaches to life and appearance that must change. GEMINI: It’s time to carefully focus upon the new where I Structure, relating to your career, public and professional life and views upon authority. As your wealth and abilities to feel good about transformation are supported through patience, you will need private time to retreat and process it all. CANCER: It’s time to carefully focus upon the new with what I Believe, relating to your willingness to be educated, abilities to grow, stand in your truth and express your philosophies. Many concerns surround your partnerships, and the direction of your future that is equally crucial to consider with them. LEO: It’s time to carefully focus upon the new where I Transform, relating to your wealth, sexuality, abilities to transform, regenerate and change. You have never been this responsible to diligently change your lifestyle as you are serving yourself and others, which undeniably accelerates your career and public life. VIRGO: It’s time to carefully focus upon the new where I Relate, connecting to your partnerships, legal agreements, business and personal relationships. Both your creative nature and your connections to children demand you to simply take charge and grow stability that sustains the truth, not false beliefs. LIBRA: It’s time to carefully focus upon the new where I Serve, relating to your habits, routines, service to self and others, and your physical health. Your home and family life is hard at work these days, and now you realize this transformative process was only meant to stabilize your scope on what wealth really means. SCORPIO: It’s time to carefully focus upon the new where I Create, relating to your brain children, manifestations, physical children, love affairs and pleasures. Grab thoughts and ideas surrounding the recreation of existing projects, and implement the new later, after relationship conclusions clear away. SAGITTARIUS: It’s time to carefully focus upon the new with how I Nurture, relating to your home, family, closest environments, psyche and paternal energies. Your securities, income, and overall value system are deeply involved in resetting the bar here, and take a look at how your lifestyle really needs to change. CAPRICORN: It’s time to carefully focus upon the new with what I Communicate, relating to your thinking, mentality, mindset, siblings and neighbors. The world eagerly applauds you as you reveal your approaches to life are learning more all the time, and be patient with your children and creative nature. AQUARIUS: It’s time to carefully focus upon the new with what I Have, relating to your income, values, possessions and overall sense of security. Time spent in solitude allows you to explore your real feelings concerning your value system, possessions and money and speaks to taking nurturing action in your family life. PISCES: It’s time to carefully focus upon the new with who I Am, relating to your appearance, emerging self, and the mask you wear to the world. Your future is responsibly changing shape, which definitely wants you to have fun with your friends and social scenes, so be friendly and let go of the fears in your mindset. What’s your Personal Forecast say for this Pisces New Moon & Mercury Retrograde from your natal chart? BOOK NOW and schedule your private session with Sharita! Waxing Phases favor actions involving planting anew and moving forward, as energy increases throughout one half of your Zodiac Pie from 15 degrees Aquarius through Pisces, Aries, Taurus, Gemini, Cancer and Leo until the next Full Moon at 0 degrees Virgo 19 February. This second New Moon of Winter and of 2019 falls within the sign that consciously aims for truth, knowledge and altruism. Our abilities to investigate, co-ordinate, synthesize and plan for reform within this area of our lives all concern what is new via its’ energetic channel as our free will accepts and embraces unconventional ways to watch beginnings unfold. We are extremely favored to attract good fortune surrounding what is naturally emerging anew, as along as ultimate responsibility and a spiritual vantage point is being honored versus planting our new intentions with any kind of greed or deception being involved. We have another distinct opportunity as our previous Libra, Scorpio, Sagittarius and Capricorn New Moons offered in October, November, December and January to tap into what needs to be further understood concerning our relationship to materialism across the board. This is the fifth New Moon in a series of 7 through 05 April 2019’s New Moon in Aries that will all fall at the 15th degree. The entire world is being distinctly asked to come into a powerful realignment concerning our relationship to materialism -which if denied- will cause upsets and situations to personally arise that could otherwise be completely avoided. This New Moon at the 15 degree point of Aquarius specifically asks that we look at both sides of any issue concerning the value of materialism where The Water Bearer seeks for our friendliness and sincerity to shine within our lives. We are advised to be aware of the high sensitivity around us, seeking for our imagination to work for us, not against us in self-deception or being too willing to sacrifice ourselves for others. By tuning into the rewards of a silent listen, we have the means instead to ground our intentions and receive necessary clarity. As we realize the responsibility of recognizing how much intuition is able to serve our highest good, we will no longer deny its’ value in our lives. In our new Universal 12/3 Year of Being Reachable and Teachable, our first new moon opens the doors wide open for us to be willing to change, and be eager about the process of growth it is meant to being to us in our individual ways. AND! Happy Chinese New Year of the Earth Pig! | 05 February 2019 to 24 January 2020. Winter’s & 2019’s 2nd New Moon is here Dear Star! How will you embrace Aligning Your Fortune for Spirited Materialism ? ARIES: It’s time to focus upon the new where I Socialize, relating to your future goals, aspirations, friends, groups, peers and ultimate hopes and wishes. There is so much here to embrace that accelerates your growth and teachable side that has you believing you are simply in the right place at the right time. TAURUS: It’s time to focus upon the new where I Structure, relating to your career, public and professional life and views upon authority. Connect your lucky dots to the positive energy changing your view on how the entire scope of your life is looking up, especially your wealth and abilities to feel good about transformation. GEMINI: It’s time to focus upon the new with what I Believe, relating to your willingness to be educated, abilities to grow, stand in your truth and express your philosophies. There are a many things you need to accept from your partnerships who are able to provide you with the wisdom that only accentuates your teachable self. CANCER: It’s time to focus upon the new where I Transform, relating to your wealth, sexuality, abilities to transform, regenerate and change. More ways that seek to enhance your lifestyle and work with you agreeably to know you are serving yourself and other like never before, channels in more than positive vibes for you to thrive in. LEO: It’s time to focus upon the new where I Relate, connecting to your partnerships, legal agreements, business and personal relationships. Staying positive is what graces your creative nature with an absolute ease for it to flow, as well as any connections to children, so make sure to give gratitude to everyone involved. VIRGO: It’s time to focus upon the new where I Serve, relating to your habits, routines, service to self and others, and your physical health. All is a changing in ways that connect the most to your home and family life, where now you must look at how the glass is half full and not empty in order to accept the truth and not deny it. LIBRA: It’s time to focus upon the new where I Create, relating to your brain children, manifestations, physical children, love affairs and pleasures. There is no better time for you to be equally grabbing complete inspirational thoughts and ideas, so be sure you are capturing them as they are ready for you to soar with them. SCORPIO: It’s time to focus upon the new with how I Nurture, relating to your home, family, closest environments, psyche and paternal energies. What matters the most concerning your securities, income, and overall value system is deeply involved in resetting the bar here, so keep your eye on the abundance prize and be ready to receive it. SAGITTARIUS: It’s time to focus upon the new with what I Communicate, relating to your thinking, mentality, mindset, siblings and neighbors. This connects to a whole new side of you that the world eagerly awaits for you to show to it as your approaches to life are learning more all the time, so keep aiming your arrows in a growth mindset. CAPRICORN: It’s time to carefully focus upon the new with what I Have, relating to your income, values, possessions and overall sense of security. Take some time to spend in solitude and process deeply from within about your real feelings about the material objects in your life and whether they need to still be valued or not. AQUARIUS: It’s time to focus upon the new with who I Am, relating to your appearance, emerging self, and the mask you wear to the world. Everything is looking up for how your future is changing shape, which definitely wants for you to have more fun with your friends and social scenes, so get out there and be friendly. PISCES: It’s time to focus upon the new where I Process, relating to your solitude, retreat, inner work your subconscious and dream state. You have things that are most concerned with what it is your are learning the most about these days within your career and public life, so take this time to give gratitude and see what is growing here. What’s your Personal Forecast say for this Aquarius New Moon from your natal chart? BOOK NOW and schedule your private session with Sharita! Waxing Phases favor actions involving planting anew and moving forward, as energy increases throughout one half of your Zodiac Pie from 15 degrees Capricorn through Aquarius, Pisces, Aries, Taurus, Gemini and Cancer until the next Full Moon and Lunar Eclipse at 0 degrees Leo 21 January. This first New Moon of Winter and of 2019 falls within the sign that consciously aims for integrity, reverence and duty. Our abilities to utilize, conserve, organize and persevere within this area of our lives are given an extra boost of confidence concerning all that is new due to being coupled by the Solar Eclipse. This energetic channel of accepting and embracing the new extends itself far beyond our waxing phase especially through the next 6 months as well as the course of the entire year. We have another distinct opportunity as our previous Libra, Scorpio and Sagittarius New Moons offered in October, November and December to tap into what needs simplification concerning materialism across the board. This is the fourth New Moon in a series of 7 through 05 April 2019’s New Moon in Aries that will all fall at the 15th degree. The entire world is being distinctly asked to come into a powerful realignment concerning our relationship to materialism -which if denied- will cause upsets and situations to personally arise that could otherwise be completely avoided. This New Moon and Solar Eclipse at the 15 degree point of Capricorn specifically asks that we look at both sides of any issue concerning the value of materialism where The Goat seeks our ambition to shine our lives. We are advised to be aware of the high sensitivity around us, seeking for our imagination to work for us, not against us in self-deception or being too willing to sacrifice ourselves for others. By tuning into the rewards of a silent listen, we have the means instead to ground our intentions and receive necessary clarity. As we realize the responsibility of recognizing how much intuition is able to serve our highest good, we will no longer deny its’ value in our lives. In our new Universal 12/3 Year of Being Reachable and Teachable, our first new moon opens the doors wide open for us to be willing to change, and be eager about the process of growth it is meant to being to us in our individual ways. Winter’s & 2019’s 1st New Moon is here along with a Solar Eclipse Dear Star! How will you embrace Your Duty to Intuitively Heal Materialism? ARIES: It’s time to focus upon the new where I Structure, relating to your career, public and professional life and views upon authority. Bring along only what you can rely upon from the past, and stop being fooled by it. TAURUS: It’s time to focus upon the new with what I Believe, relating to your willingness to be educated, abilities to grow, stand in your truth and express your philosophies. Carefully listen to what needs to change about the direction of your future. GEMINI: It’s time to focus upon the new where I Transform, relating to your wealth, sexuality, abilities to transform, regenerate and change. Be discreet with decisions involving your career and public life. CANCER: It’s time to focus upon the new where I Relate, connecting to your partnerships, legal agreements, business and personal relationships. This is a powerful time to stand in your truth, and ceased being deceived by false fears. LEO: It’s time to focus upon the new where I Serve, relating to your habits, routines, service to self and others, and your physical health. Take considerable notice concerning your scope on wealth, and recognize the sensitive rebirth surrounding you. VIRGO: It’s time to focus upon the new where I Create, relating to your brain children, manifestations, physical children, love affairs and pleasures. Your partnerships seek for you to understand them more, so be sure to give them that necessary silent listen. LIBRA: It’s time to focus upon the new with how I Nurture, relating to your home, family, closest environments, psyche and paternal energies. Look to your lifestyle choices, and be sure you are making the wiser decisions concerning them. SCORPIO: It’s time to focus upon the new with what I Communicate, relating to your thinking, mentality, mindset, siblings and neighbors. Grab hold of your creative inspirations which will not be shy when you choose to listen carefully to them. SAGITTARIUS: It’s time to carefully focus upon the new with what I Have, relating to your income, values, possessions and overall sense of security. Utilize your instinct and careful consideration at home when dealing with your family life. CAPRICORN: It’s time to focus upon the new with who I Am, relating to your appearance, emerging self, and the mask you wear to the world. Remember, the more you pause and practice learning to trust your intuition, the more peace of mind you will possess. AQUARIUS: It’s time to focus upon the new where I Process, relating to your solitude, retreat, inner work your subconscious and dream state. There is an undeniable value you will receive, far greater than any monetary amount that allows you to know you have complete security. PISCES: It’s time to focus upon the new where I Socialize, relating to your future goals, aspirations, friends, groups, peers and ultimate hopes and wishes. Yes, Dear Fishes, it is time for you to appear fresh faced to the world with your illuminating intuition. What’s your Personal Forecast say for this Capricorn Solar Eclipse and New Moon from your natal chart? BOOK NOW and schedule your private session with Sharita! Waxing Phases favor actions involving planting anew and moving forward, as energy increases throughout one half of your Zodiac Pie from 15 degrees Sagittarius through Capricorn, Aquarius, Pisces, Aries, Taurus and Gemini until the next Full Moon at 0 degrees Cancer 22 December. This last New Moon of Autumn and of 2018 falls within the sign that consciously aims for wisdom, the truth, and honesty. Our abilities to grow and broaden our perspectives to move forward with after Mercury just backtracked here in Retrograde (16 November to 01 December) are seeking for us to now apply what we have recently learned in review and renewal. This is continues to be a profound time to listen carefully to the areas of our lives from where we communicate and can easily make changes from. We have another distinct opportunity as our previous Libra and Scorpio New Moons offered in October and November to tap into what needs simplification concerning materialism across the board. This is the third New Moon in a series of 7 through 05 April 2019’s New Moon in Aries that will all fall at the 15th degree. The entire world is being distinctly asked to come into a powerful realignment concerning our relationship to materialism -which if denied- will cause upsets and situations to personally arise that could otherwise be completely avoided. This New Moon at the 15 degree point of Sagittarius specifically asks that we look at both sides of any issue concerning the value of materialism where The Archer aims our lives, and not be taken away by the deception of blind faith nor be too headstrong resulting in impulsive behaviors. Instead, embracing a courageous force of intuition and fully accepting we must engage in a growth mindset serves our highest good. In other words, how teachable are we? We will notice this also is a preview of 2019’s theme that is also about to begin before we conclude all that 2018 and Feeling the Feminine has asked for us to accomplish. We do need to air of the side of caution for this waxing phase as the Shadows of both Venus Retrograde (until 17 December) and Mercury Retrograde (until 24 December) as they cast another awareness net around what we are beginning anew. While we absolutely do have the green light -finally after feeling delayed and offset all autumn long- to quickly finish of the year, yet we must continue to carry careful consideration by our side. As with all Shadow passages of inner planet retrograde cycles, as we iron out our reflection wrinkles, we still are advised to cross those t’s and dot those i’s until they complete. Autumn & 2018’s Last New Moon is here Dear Star! How will you embrace Courageous Perceptions Regarding Materialism? ARIES: It’s time to focus upon the new with what I Believe, relating to your willingness to be educated, abilities to grow, stand in your truth and express your philosophies. Time alone in solitude assists you and should not be denied for the clarity you need. TAURUS: It’s time to focus upon the new where I Transform, relating to your wealth, sexuality, abilities to transform, regenerate and change. Whatever you may have thought your future holds, be ready to listen carefully to your peers concerning it. GEMINI: It’s time to focus upon the new where I Relate, connecting to your partnerships, legal agreements, business and personal relationships. Everything you are doing in your public life surrounding your vocation depends upon you understanding them. CANCER: It’s time to focus upon the new where I Serve, relating to your habits, routines, service to self and others, and your physical health. As your listening skills need to discern the real truth of these matters more than ever, dive deep into what you can learn. LEO: It’s time to focus upon the new where I Create, relating to your brain children, manifestations, physical children, love affairs and pleasures. Plummet further to the powerful transformation you are amidst, for it grants the strength you need to release the painful past. VIRGO: It’s time to focus upon the new with how I Nurture, relating to your home, family, closest environments, psyche and paternal energies. Courage is what it takes to bring the desires of your partnerships to the understanding they are determined to have. LIBRA: It’s time to focus upon the new with what I Communicate, relating to your thinking, mentality, mindset, siblings and neighbors. Rapid changes concerning your lifestyle require your careful consideration to serve you and others better. SCORPIO: It’s time to carefully focus upon the new with what I Have, relating to your income, values, possessions and overall sense of security. If you resist that your creative nature needs to be involved, you will miss out on manifesting great things. SAGITTARIUS: It’s time to focus upon the new with who I Am, relating to your appearance, emerging self, and the mask you wear to the world. Bite your tongue at home and choose to seek to understand, which requires you stop talking and listen. CAPRICORN: It’s time to focus upon the new where I Process, relating to your solitude, retreat, inner work your subconscious and dream state. Take time to quiet your mind and absolutely write things down, for there are brainstorms you must ignite. AQUARIUS: It’s time to focus upon the new where I Socialize, relating to your future goals, aspirations, friends, groups, peers and ultimate hopes and wishes. There is a reason why your income and value system is on high alert, for it is directly involved with these changes. PISCES: It’s time to focus upon the new where I Structure, relating to your career, public and professional life and views upon authority. As much as we know you rely on the past, it is time to let it go and focus upon the changing face of you. What’s your Personal Forecast say for this Sagittarius New Moon from your natal chart? BOOK NOW and schedule your private session with Sharita! Waxing Phases favor actions involving planting anew and moving forward, as energy increases throughout one half of your Zodiac Pie from 15 degrees Scorpio through Sagittarius, Capricorn, Aquarius, Pisces, Aries and Taurus until the next Full Moon at 0 degrees Gemini 23 November. This second New Moon of Autumn 2018 falls within the sign of power, rebirth and transformation, favoring for a deep look at death and rebirth that undeniably shows us wealth is far beyond a financial picture. This is a profound time to listen carefully to the intuitive areas of our lives from where we both organize and communicate from. We have another distinct opportunity as our previous Libra New Moon offered in October to tap into what needs simplification concerning materialism across the board. This is the second New Moon in a series of 7 through 05 April 2019’s New Moon in Aries that will all fall at the 15th degree. The entire world is being distinctly asked to come into a powerful realignment concerning our relationship to materialism -which if denied- will cause upsets and situations to personally arise that could otherwise be completely avoided. This New Moon at the 15 degree point of Scorpio continues to ask that we look at both sides of any issue concerning value within our lives, with intuition at our side and to accept what it is that we must allow to become reborn in order to do so. This request is equally intensified as Venus Retrograde is still in transit until 16 November, casting another mindful net around what we may be beginning anew for this waxing phase, while the preview to more reflection is also underway as the Approach to the year’s final Mercury Retrograde (16 November to 06 December) has been on since 28 October. Whatever we may be shown that especially relates to money, beauty, value, luxury, legal agreements and relationships that doesn’t already exist- absolutely needs to be very carefully researched and monitored. Remembering Retrogrades always favor we simply return to what already exists for review and redo success, allows these specific areas of focus to find a positive flow of renewal, refreshment and intense resolutions to unfold. Autumn’s 2nd New Moon is here Dear Star! How will you embrace Transforming Materialism with Intuition? ARIES: It’s time to carefully focus upon the new where I Transform, relating to your wealth, sexuality, abilities to transform, regenerate and change. Take time alone to retreat and see what this all means for reshaping your career. TAURUS: It’s time to carefully focus upon the new where I Relate, connecting to your partnerships, legal agreements, business and personal relationships. With so much healing surrounding your future goals, stand strong in your powerful new truths. GEMINI: It’s time to carefully focus upon the new where I Serve, relating to your habits, routines, service to self and others, and your physical health. Don’t fall to deception in your professional life, and recognize you need patience to rebuild your wealth. CANCER: It’s time to carefully focus upon the new where I Create, relating to your brain children, manifestations, physical children, love affairs and pleasures. You must carefully discern what it is you truly believe about the influence of your partnerships. LEO: It’s time to carefully focus upon the new with how I Nurture, relating to your home, family, closest environments, psyche and paternal energies. Embrace the healing absolutely propelling you into rebirth with ultimate integrity for your lifestyle and self-care. VIRGO: It’s time to carefully focus upon the new with what I Communicate, relating to your thinking, mentality, mindset, siblings and neighbors. Erase your doubt and listen to the insight your intimate relationships provide to transform connections to your children and creativity. LIBRA: It’s time to carefully focus upon the new with what I Have, relating to your income, values, possessions and overall sense of security. Keep adapting to better habits and routines allowing for spiritual growth, and witness the power you can nourish with at home. SCORPIO: It’s time to carefully focus upon the new with who I Am, relating to your appearance, emerging self, and the mask you wear to the world. Listen carefully to your children and creative nature for wealthy ideas that initiate an entirely new frame of mind. SAGITTARIUS: It’s time to carefully focus upon the new where I Process, relating to your solitude, retreat, inner work your subconscious and dream state. Being more mindful at home to nurture from your instinct grants you value and security like never before. CAPRICORN: It’s time to carefully focus upon the new where I Socialize, relating to your future goals, aspirations, friends, groups, peers and ultimate hopes and wishes. Take time to quiet your thoughts in a SILENT LISTEN to embrace the power of the new you. AQUARIUS: It’s time to carefully focus upon the new where I Structure, relating to your career, public and professional life and views upon authority. Utilize your intuition concerning your security to reveal genuine value requiring you to retreat within to receive it. PISCES: It’s time to carefully focus upon the new with what I Believe, relating to your willingness to be educated, abilities to grow, stand in your truth and express your philosophies. Honoring wisdom for all your approaches to life unlocks the power your future holds. What’s your Personal Forecast say for this Scorpio Moon from your natal chart? BOOK NOW and schedule your private session with Sharita! Waxing Phases favor actions involving planting anew and moving forward, as energy increases throughout one half of your Zodiac Pie from 15 degrees Libra through Scorpio, Sagittarius, Capricorn, Aquarius, Pisces and Aries until the next Full Moon at 01 degrees Taurus 24 October. This first New Moon of Autumn 2018 falls within the sign of adjustment and balance, equally favoring for understanding to work with us to arrive at another stage of alignment. Once again, the leadership areas of our lives are called into this initiating conversation, asking for us to consider how we can nourish differently. Undeniably, there is more surrender to being responsible to regeneration and deep transformation in this entire process, placing intention the most upon what we are meant to simplify concerning materialism across the board. 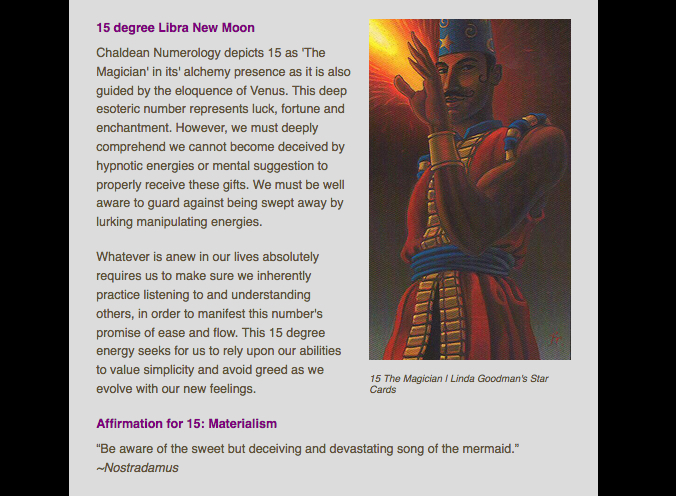 This New Moon at the 15 degree point of Libra has loads of caution surrounding it involving value requiring we look at both side of any issue concerning it. This request is equally intensified as Venus Retrograde also just began 05 October, casting another mindful net around what we may be beginning anew for this waxing phase. Whatever we may be shown that relates to money, beauty, value, luxury, legal agreements and relationships that has never been done before- absolutely needs to be very carefully researched and monitored. Remembering Retrogrades always favor we simply return to what already exists for review and redo success, allows these specific areas of focus to find a positive flow of renewal and refreshment. Autumn’s 1st New Moon is here Dear Star! How will you embrace Understanding the Devaluing of Materialism? ARIES: It’s time to carefully focus upon the new where I Relate, connecting to your partnerships, legal agreements, business and personal relationships. Listen to your family and recognize you have profession and career changes to make. TAURUS: It’s time to carefully focus upon the new where I Serve, relating to your habits, routines, service to self and others, and your physical health. Instinctively work with your communication skills to sharpen your scope upon what you believe. GEMINI: It’s time to carefully focus upon the new where I Create, relating to your brain children, manifestations, physical children, love affairs and pleasures. Carefully consider income changes and embrace research concerning your wealth. CANCER: It’s time to carefully focus upon the new with how I Nurture, relating to your home, family, closest environments, psyche and paternal energies. As your emerging self is intuitively changing, guard against power plays with your relationships. LEO: It’s time to carefully focus upon the new with what I Communicate, relating to your thinking, mentality, mindset, siblings and neighbors. You cherish taking time alone in retreat to dive deeper into practicing responsible habits and routines. VIRGO: It’s time to carefully focus upon the new with what I Have, relating to your income, values, possessions and overall sense of security. Utilize your instinct concerning your future goals, involving pure transformation for your creative abilities. LIBRA: It’s time to carefully focus upon the new with who I Am, relating to your appearance, emerging self, and the mask you wear to the world. Bring understanding into your public life and vocation as you navigate rebirth within your home life. SCORPIO: It’s time to carefully focus upon the new where I Process, relating to your solitude, retreat, inner work your subconscious and dream state. Your imagination is necessary to listen to the truth, regenerating your entire frame of mind. SAGITTARIUS: It’s time to carefully focus upon the new where I Socialize, relating to your future goals, aspirations, friends, groups, peers and ultimate hopes and wishes. Be cautious managing your wealth as you equally redefine your sense of security. CAPRICORN: It’s time to carefully focus upon the new where I Structure, relating to your career, public and professional life and views upon authority. Nourish your existing partnerships and understand the changing face of you is powerful. AQUARIUS: It’s time to carefully focus upon the new with what I Believe, relating to your willingness to be educated, abilities to grow, stand in your truth and express your philosophies. Serve yourself up some needed TLC by taking time in solitude. PISCES: It’s time to carefully focus upon the new where I Transform, relating to your wealth, sexuality, abilities to transform, regenerate and change. Be inspired by what you can create or do with children and continue to transform your future. What’s your Personal Forecast say for this Libra New Moon from your natal chart? BOOK NOW and schedule a private session with Sharita! Waxing Phases favor actions involving planting anew and moving forward, as energy increases throughout one half of your Zodiac Pie from 17 degrees Virgo through Libra, Scorpio, Sagittarius, Capricorn, Aquarius and Pisces until the next Full Moon at 01 degrees Aries 24 September. As our last & 3rd New Moon of Summer 2018 falls within the sign of purity and innocence, equally favoring for use to honor the practices of love, peace and spiritual awareness to powerfully tap into a momentum that promises rebirth to be accompanied by an extremely grounded energy. This New Moon at the 17 degree point asks for our ultimate responsibility to work strongly with intuition, especially concerning our means to understand another regenerative process is involved in the process of change we are experiencing. By embracing the full understanding what we set into motion now will be remembered for eternity, we hold our keys to success. Summer’s Last & 3rd New Moon is here Dear Star! Where are you favored to Respect Transformation for Eternal Change? ARIES: It’s time to intently focus upon the new where I Serve, relating to your habits, routines, service to self and others, and your physical health. Time alone helps you receive clarity for your regenerating career. TAURUS: It’s time to intently focus upon the new where I Create, relating to your brain children, manifestations, physical children, love affairs and pleasures. Listen carefully to your future goals to realign your beliefs. GEMINI: It’s time to intently focus upon the new with how I Nurture, relating to your home, family, closest environments, psyche and paternal energies. Cast off uncertainty in your career and step into a powerful rebirth for your wealth. CANCER: It’s time to intently focus upon the new with what I Communicate, relating to your thinking, mentality, mindset, siblings and neighbors. Honor your truth with your partnerships and watch them strengthen. LEO: It’s time to intently focus upon the new with what I Have, relating to your income, values, possessions and overall sense of security. Make instinctive moves concerning your wealth as you sharpen your habits and routines. VIRGO: It’s time to intently focus upon the new with who I Am, relating to your appearance, emerging self, and the mask you wear to the world. Deeply understand your partnerships provide power for your creativity and children. LIBRA: It’s time to intently focus upon the new where I Process, relating to your solitude, retreat, inner work your subconscious and dream state. As you ultimately heal with lifestyle changes, your home and family receive the benefits. SCORPIO: It’s time to intently focus upon the new where I Socialize, relating to your future goals, aspirations, friends, groups, peers and ultimate hopes and wishes. Allow your intuition to channel into your creative nature to capture powerful ideas. SAGITTARIUS: It’s time to intently focus upon the new where I Structure, relating to your career, public and professional life and views upon authority. Nourish your home and family life to align you in greater stability and value. CAPRICORN: It’s time to intently focus upon the new with what I Believe, relating to your willingness to be educated, abilities to grow, stand in your truth and express your philosophies. Listen intently for harmonious thoughts and reign in your personal power. AQUARIUS: It’s time to intently focus upon the new where I Transform, relating to your wealth, sexuality, abilities to transform, regenerate and change. Give gratitude to what you have as you take time to release any worries from within. PISCES: It’s time to intently focus upon the new where I Relate, connecting to your partnerships, legal agreements, business and personal relationships. Listen to your instinct and recognize you absolutely have the power to change your future. What’s your Personal Forecast say for this Virgo Moon from your natal chart? BOOK NOW and schedule a private session with Sharita! This Summer 2018, we have quite the intense eclipse season in which all three will occur during Mars Retrograde 26 June to 27 August, and two during Mercury Retrograde 26 July to 19 August. Check in where each of this Summer’s Eclipses will be promising plenty of new beginnings and closure for you. However, be sure to be well aware of how to navigate during our Retrograde time frames with all of your matters of importance. What’s your Personal Forecast say for this Summer’s Eclipses, New and Full Moons from your natal chart? Schedule a private session with Sharita! Follow Sharita’s Empowerscopes on EmpowerRadio.com for weekly timing is everything tips! Anytime of the month and all summer long, always be well aware of when our frequent Moon Void of Course “time outs” are in play when scheduling your matters of importance. Waxing Phases favor actions involving planting anew and moving forward, as energy increases throughout one half of your Zodiac Pie from 18 degrees Leo through Virgo, Libra, Scorpio, Sagittarius, Capricorn and Aquarius until the next Full Moon at 03 degrees Pisces 26 August. This second New Moon of Summer -whose impact is long lasting- seeks for us to be well aware of not jumping right in to these new beginnings within our lives all the same. What seeks to emerge from where The Lion asks for our loyalty to work strongly with consideration, especially concerning our means to understand there is a tremendous rebirth and regenerative process involved in the process of change we are experiencing. If we connect the dots to the last Full Moon and Lunar Eclipse 27 July, these transformational processes involve the area of our life that completes the foundation we are now in the midst of restructuring. By embracing becoming students so we can learn and grow, optimism is guaranteed to flourish. Our second New Moon of Summer 2018 is coupled with a Solar Eclipse, packing an energetic punch that outlasts the normal waxing phase for 6 months up to a years time, indicating what is naturally meant to begin from this area of the life has true staying power for the long term. This eclipse brings us full circle from the beginnings we saw from The Great American Solar Eclipse in Leo 21 August 2017. A strong calling to forget about materialism and simplify to a more sensitized spirituality will undeniably speak to embrace it with open arms, all part of our 2018’s Feeling the Feminine requests. *This waxing phase aligns in equal reflection requests from Mercury Retrograde 26 July to 19 August and Mars Retrograde 26 June to 27 August* Remember with the beginnings we will naturally start to see emerge from the potency of the Solar Eclipse, we need to apply careful attention and ultimate awareness to concerning anything we have to initiate under both Mars and Mercury Retrograde in affect. Summer’s 2nd New Moon is here along with a Solar Eclipse Dear Star! Where are you favored to listen to the divine truth? ARIES: It’s time to carefully focus upon the new where I Create, relating to your brain children, manifestations, physical children, love affairs and pleasures. Find strength when you learn about your wealth. TAURUS: It’s time to focus upon the new with how I Nurture, relating to your home, family, closest environments, psyche and paternal energies. Your partnerships that provide wisdom are ones to rely upon. GEMINI: It’s time to focus upon the new with what I Communicate, relating to your thinking, mentality, mindset, siblings and neighbors. Welcome a complete reboot to your habits and routines. CANCER: It’s time to focus upon the new with what I Have, relating to your income, values, possessions and overall sense of security. It is undeniable that your creativity is involved. LEO: It’s time to focus upon the new with who I Am, relating to your appearance, emerging self, and the mask you wear to the world. Embrace learning to nurture your home and family better. VIRGO: It’s time to focus upon the new where I Process, relating to your solitude, retreat, inner work your subconscious and dream state. If you don’t change your thinking, you miss out on healing. LIBRA: It’s time to focus upon the new where I Socialize, relating to your future goals, aspirations, friends, groups, peers and ultimate hopes and wishes. This is value you can take to the bank. SAGITTARIUS: It’s time to focus upon the new with what I Believe, relating to your willingness to be educated, abilities to grow, stand in your truth and express your philosophies. Time alone is the key to honor clearing up the past. CAPRICORN: It’s time to focus upon the new where I Transform, relating to your wealth, sexuality, abilities to transform, regenerate and change. Take a look at how your future goals are evolving. AQUARIUS: It’s time to focus upon the new where I Relate, connecting to your partnerships, legal agreements, business and personal relationships. Take all you are learning in your career and apply it. PISCES: It’s time to focus upon the new where I Serve, relating to your habits, routines, service to self and others, and your physical health. This is a growth period for your truth and ultimate beliefs. 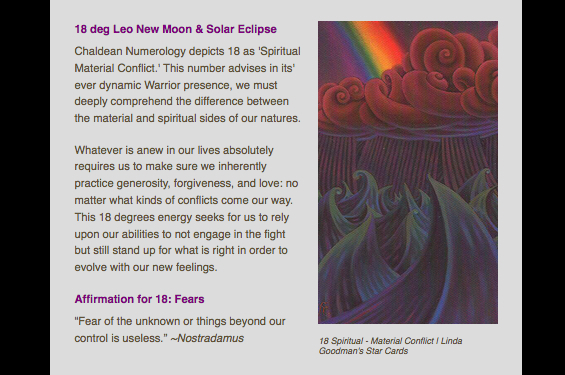 What’s your Personal Forecast say for this Leo Solar Eclipse & New Moon from your natal chart? BOOK NOW and schedule a private session with Sharita!